Let’s face it…Skeletons, Vampires & scary Spiders may not be everyone’s “cup of tea.” Guess what? That’s OK, because there are lots of other ways to decorate your home using Beistle products that aren’t so…scary. If your decorating style is a bit more chic, elegant or modern, consider trying a few of the ideas I have for you below. I’ve come up with three different color schemes paired with gold accents. Take a look at them and keep reading for a few DIY tips & ideas. Try decorating with different shades & hues of purple. Purple is often associated with royalty, luxury and all things fancy. 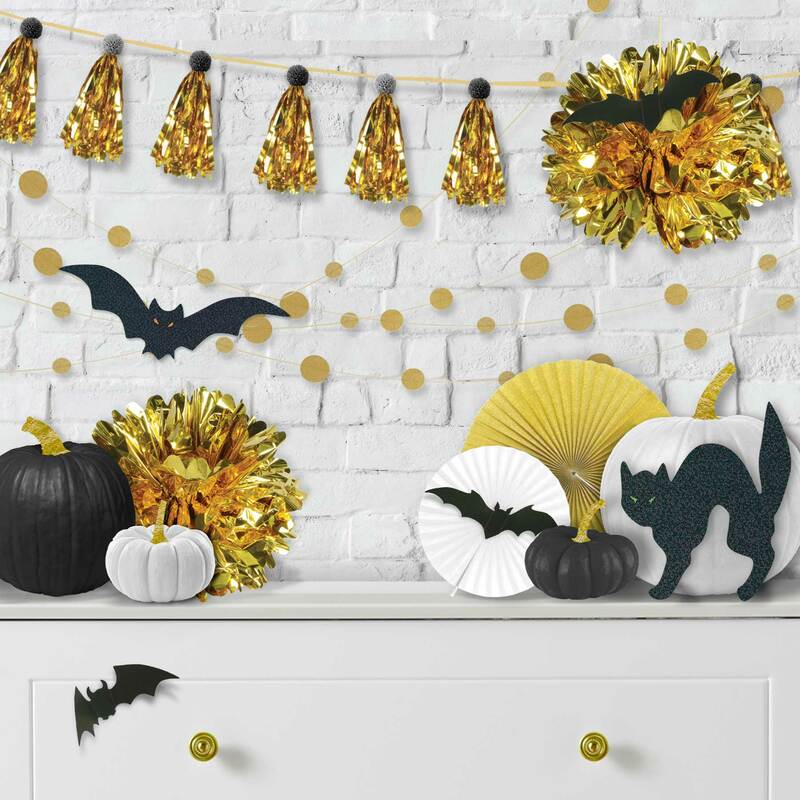 This color paired with gold accents keeps your space looking fresh and modern while still keeping with the Halloween spirit! Blue and green are often thought of as calming colors. Navy blue, paired with emerald-green & gold accents create a beautiful display. 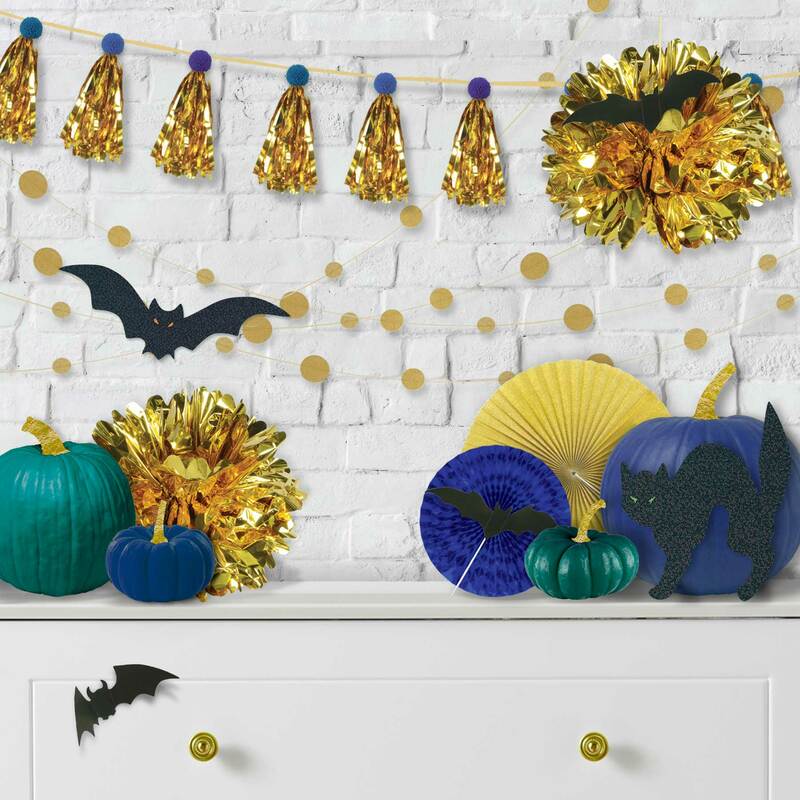 If you’re looking for a look to make your home feel cozy & comfortable, consider navy & emerald green for your Halloween decorating this season. Talk about modern! Black & white decorations have become increasingly popular…and it’s easy to see why. Keeping it simple with these two colors allows for you to have a clean, blank canvas to build from. Again, pairing these with gold accents makes this appear ultra modern & upscale. To add a bit of customization & color to your Tassel Garlands, consider using pom-poms. (You can get these at most craft stores – and size or color will work, however, 1″ would be ideal). Simply lay your garland flat on the floor and hot glue a pom to the top of each tassel. This would also be great for customizing decorations for Birthday parties, New Year’s & other events. This time of year, there are pumpkin stands popping up all over the place. Purchase a few (of different sizes & shapes) and also purchase a few small bottles of inexpensive craft paint & paint brushes. Try to get paint colors that coordinate nicely together, as well as a bottle of metallic gold. Decide which pumpkins are going to be painted each color & go for it! Finish by painting the stems of each pumpkin with the metallic gold paint. This will give them a nice, finished look. Below is a list of products that were used in the above images. 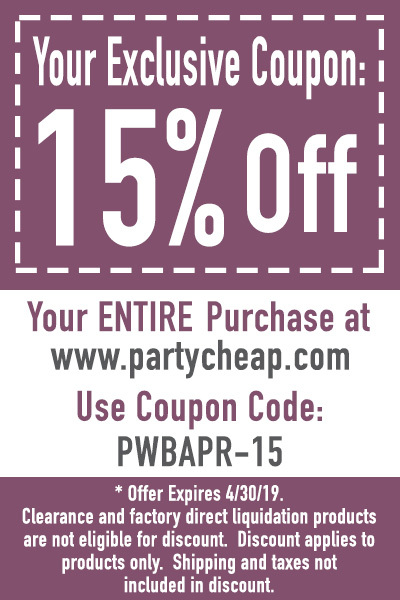 To purchase any of these items, please visit www.partycheap.com. Don’t forget to use your exclusive coupon code found on my “shop” page. Halloween Silhouettes (These are printed on a glitter material and are super pretty! I highly recommend checking them out). If you use any of these items, please feel free to tag us on social media using hashtag, #PartywithBeistle. We love seeing people’s creativity and how they like to use our products! Remember…Life’s more fun when you #PartyWithBeistle! There's No Time for a Siesta, It's Time to Fiesta! Continue the Party with Us! Enter your email address to subscribe to 'Party with Beistle' and receive notifications of new posts by email!